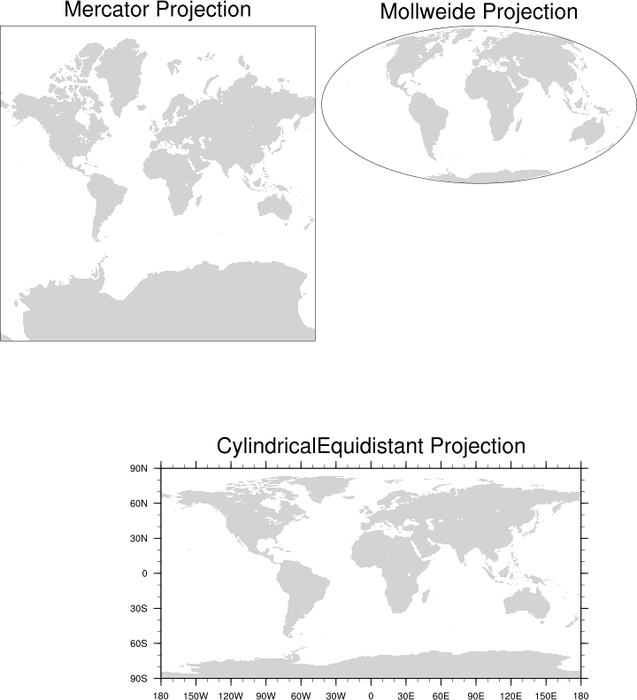 There's a third function called gsn_csm_map_ce, but it simply calls gsn_csm_map under the hood, which defaults to a cylindrical equidistant map projection unless mpProjection is set to something else. 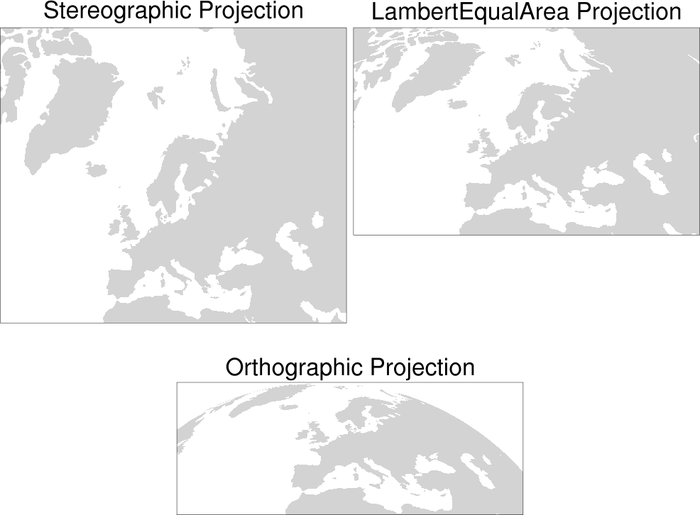 This page shows the various map projections you can create in NCL. Any of these maps can be used to overlay contours, vectors, streamlines, markers, lines, and polygons. 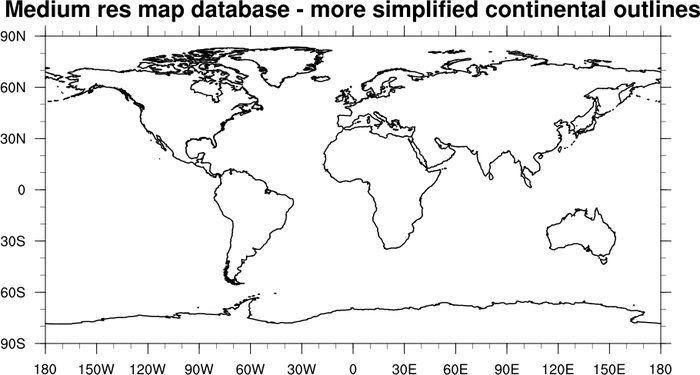 If you need more map outlines than what NCL provides, then see the Shapefiles example page. See the description at the top of the Map outlines examples page for information about a change to the behavior of the mpDataBaseVersion resource in NCL V6.4.0. 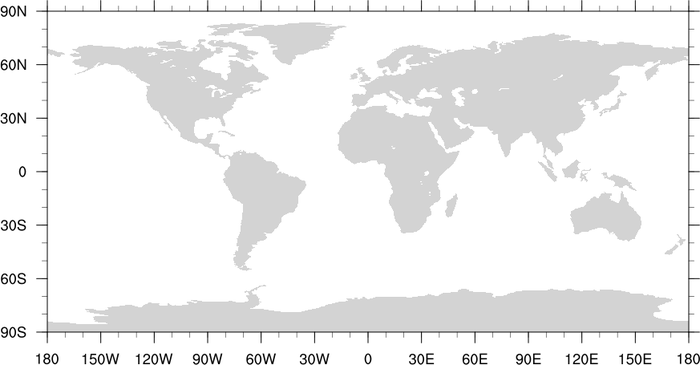 maponly_1.ncl: A cylindrical equidistant global map. 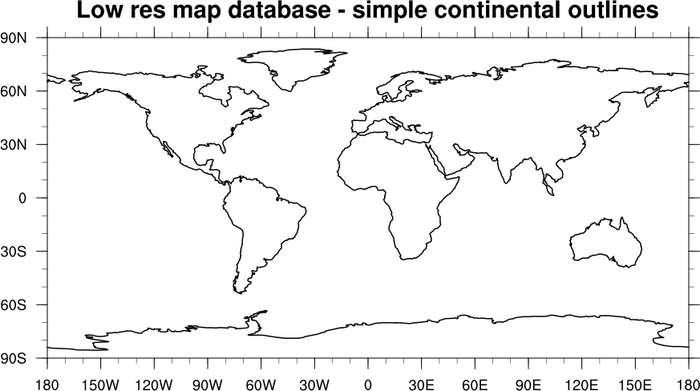 gsn_csm_map is the plot templates that draws a cylindrical equidistant map. 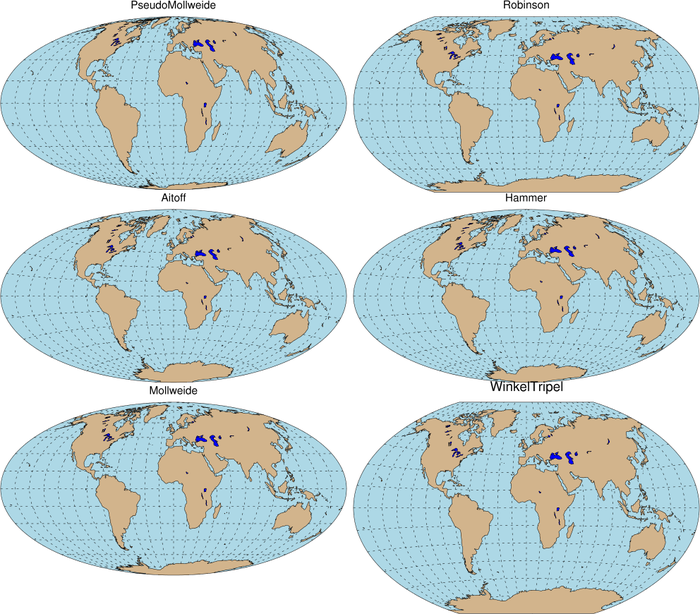 Note that the default behavior is gray filled continents. maponly_2.ncl: A subregion map with a few modifications. Note that the first two images will now look different in NCL V6.4.0 and later. See the next section to compare the images. 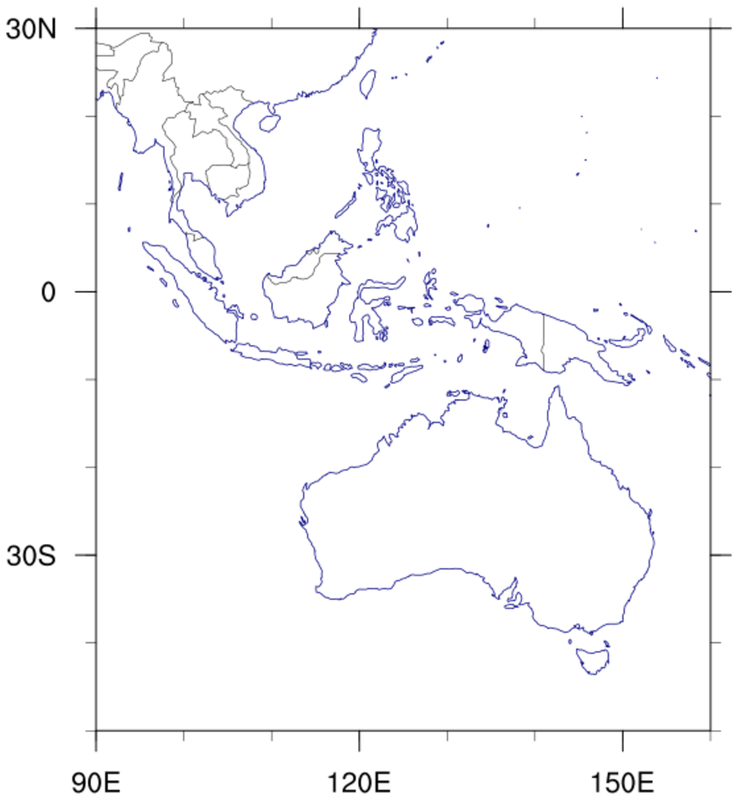 First frame: shows Australia and parts of south-east Asia. 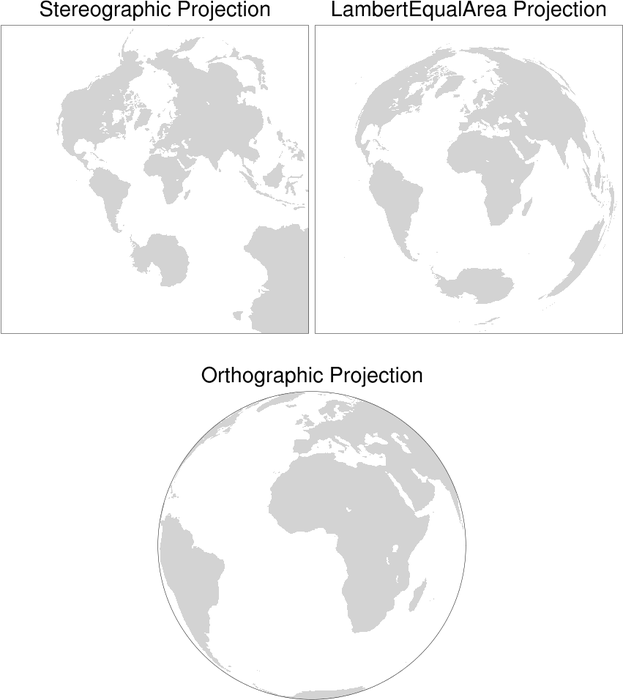 Second frame: centered on Western Eurasia. 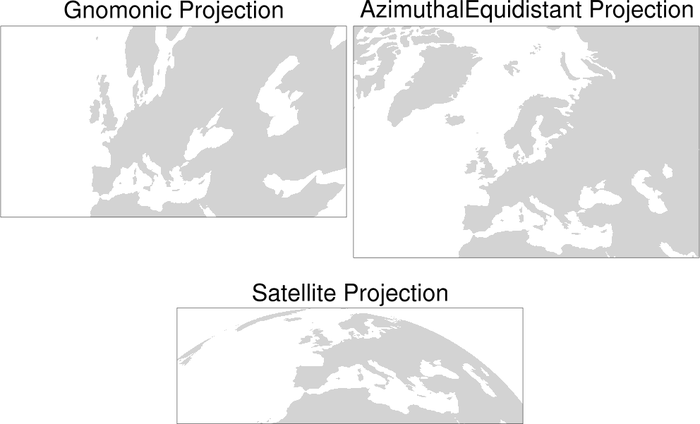 Third frame: demonstrates how to get more up-to-date country boundaries for this region along with higher resolution. mpFillOn = False - Turns off gray continental fill. mpOutlineBoundarySets = "National" - Turns on country boundaries. mpGeophysicalLineColor = "Navy" - Changes the outline line color. mpGeophysicalLineThicknessF = 1.5 - Changes the thickness of continental outlines. mpDataBaseVersion = "MediumRes" - Chooses the medium resolution database, which is required to get the most recent country borders. "MediumRes" is now the default in NCL V6.4.0 if mpOutlineBoundarySets is set to something other than "Geophysical". 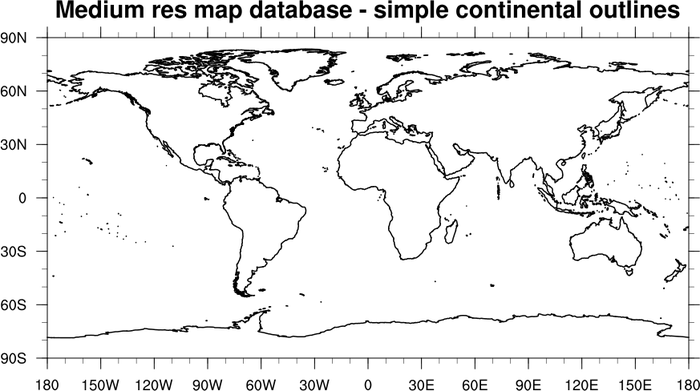 mpDataSetName = "Earth..4" - Selects the most up-to-date national boundaries. maponly_2.ncl: This is the same script as the previous example. The images have been updated to show what you get with NCL Version 6.4.0. Note that the first two images are now showing MediumRes outlines by default. 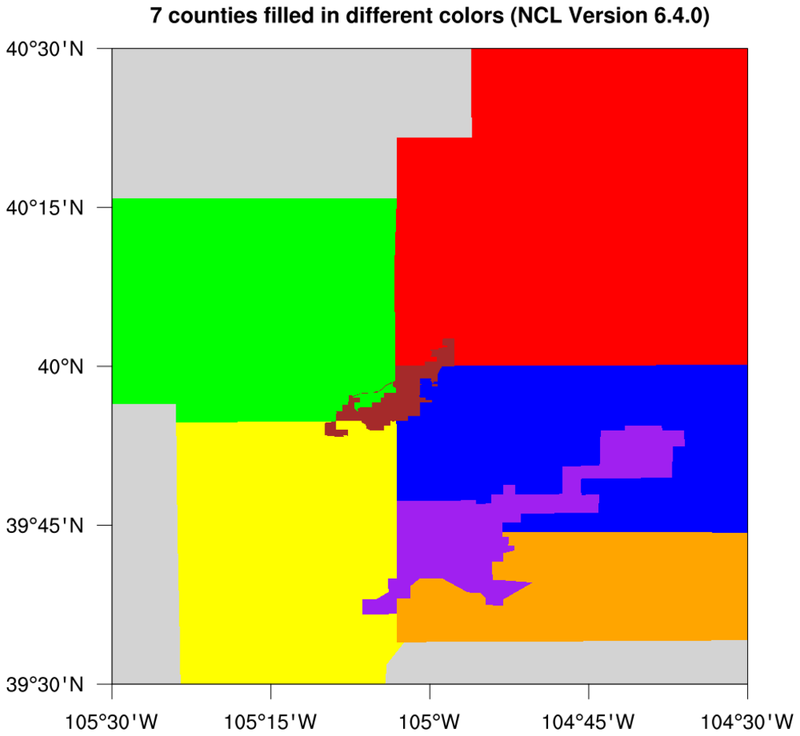 maponly_3.ncl: Demonstrates changing the colors of the various regions. 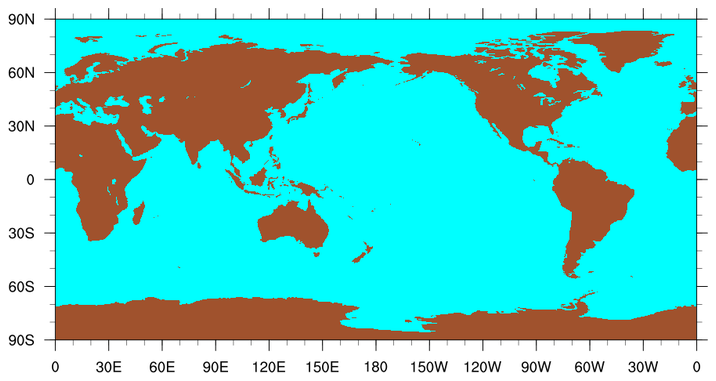 mpOceanFillColor = 8, selects the light blue color from the colormap. mpLandFillColor = 164, selects the dark orange color from the colormap. mpInlandWaterFillColor = 54, selects the dark blue color from the colormap. Note that the longitude range of the plot was changed via mpMinLonF=0 and mpMaxLonF=360, and hence mpCenterLonF had to be set to 180 reflect the true center of the plot. There are numerous color tables to choose from. 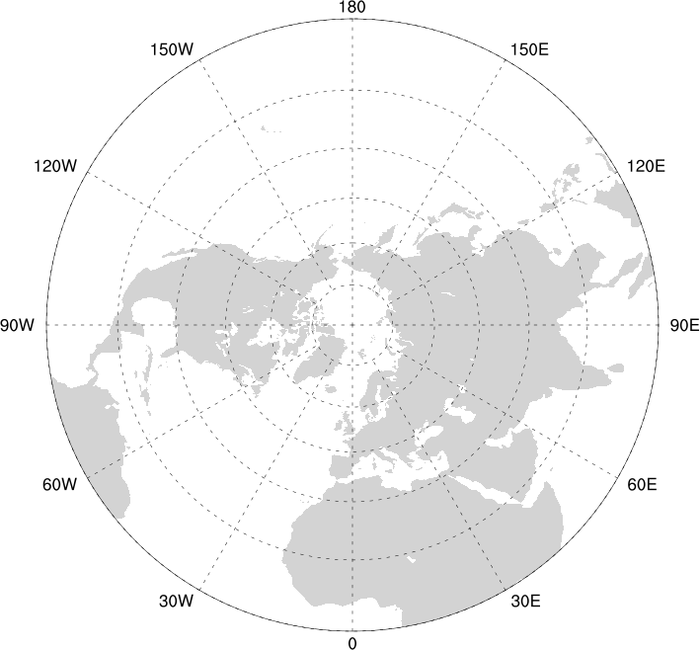 gsn_csm_map_polar is the plot templates that draws a polar map. 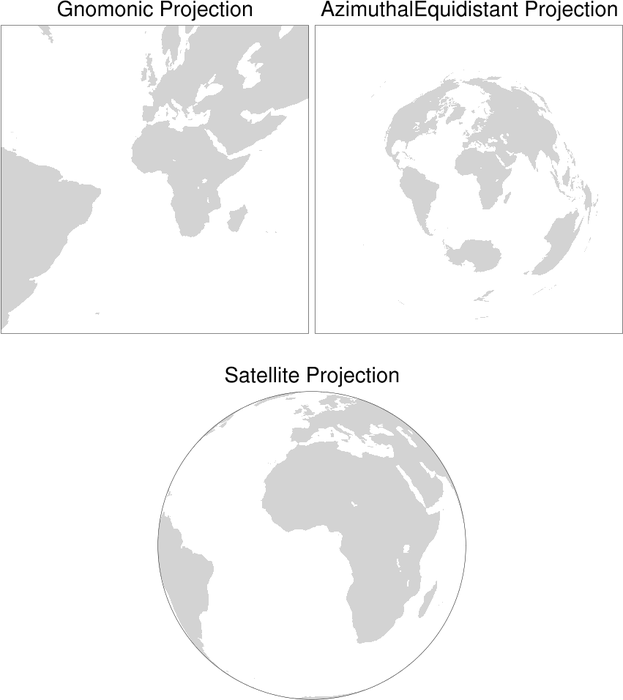 maponly_5.ncl: An example of a satellite projection map. 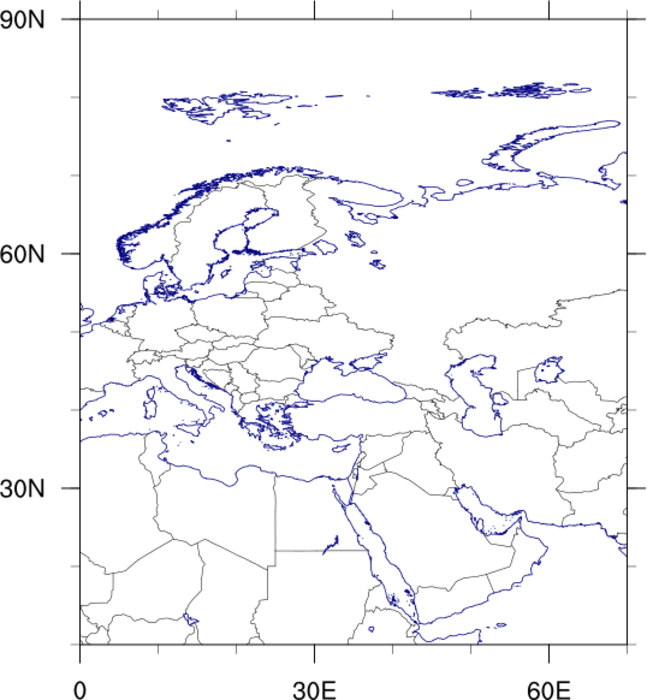 gsn_csm_map is the plot templates that draws map, where you specify the projection. mpProjection = satellite, selects projection. 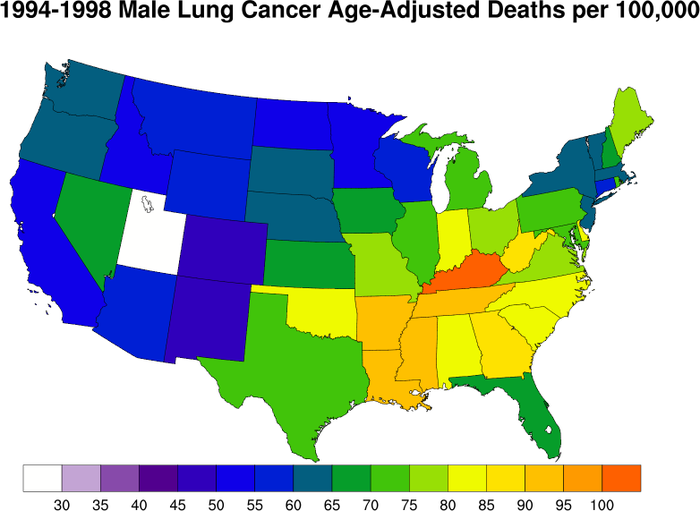 maponly_6.ncl: An example of drawing the U.S. and filling each state with a data value. GetFillColorIndex will assign a color to a polygon based on an array of color indices. maponly_7.ncl: Demonstrates how to remove portions of a map. 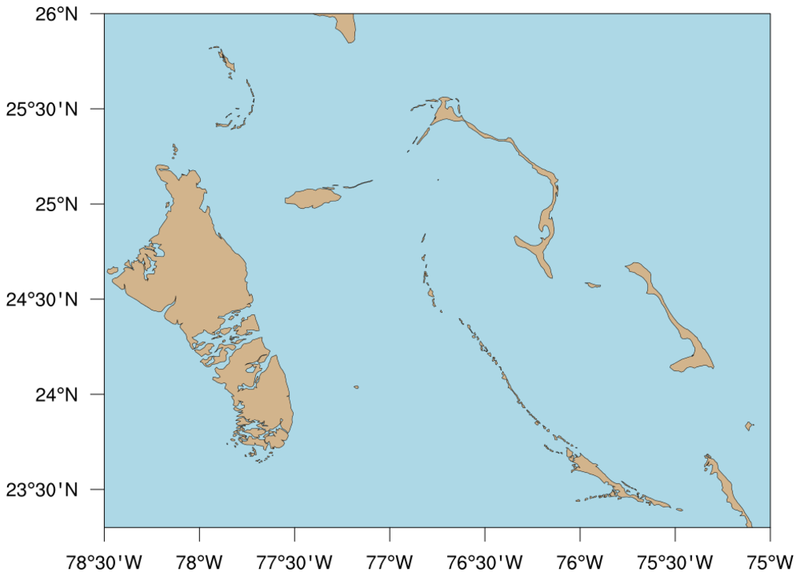 The first plot shows the default mapfill, and the second plot has had all "SmallIslands" removed. 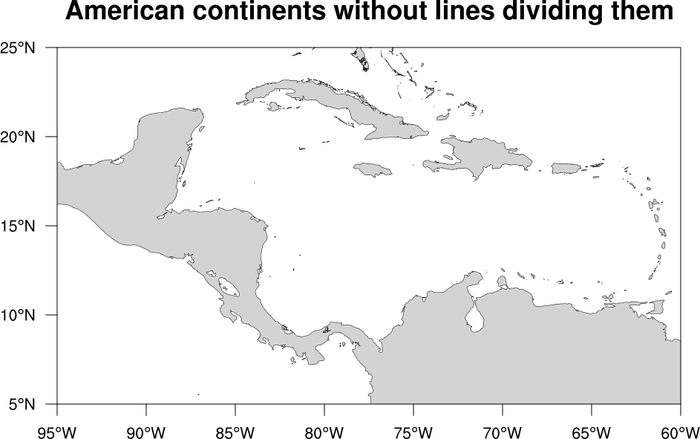 These include the Lesser Antilles, Hawaii, the Phillipine Islands etc. mpAreaMaskingOn turns on the area masking so that the regions specified in mpMaskAreaSpecifiers will not be filled. Note that if we did not turn off the map outline with mpOutlineOn, we would still see the outline, but it would not be filled. maponly_8.ncl: Demonstrates how to draw only certain portions of map when there is no map fill. This technique differs lightly from that demonstrated in example 7. In that example we exclude only the desired features. In this method we only draw the desired features. This method can thus be used to draw only those countries or boundaries that are specified in mpOutlineSpecifiers. In the third frame, China, Chinese provinces, India, and various other southeastern countries are drawn. 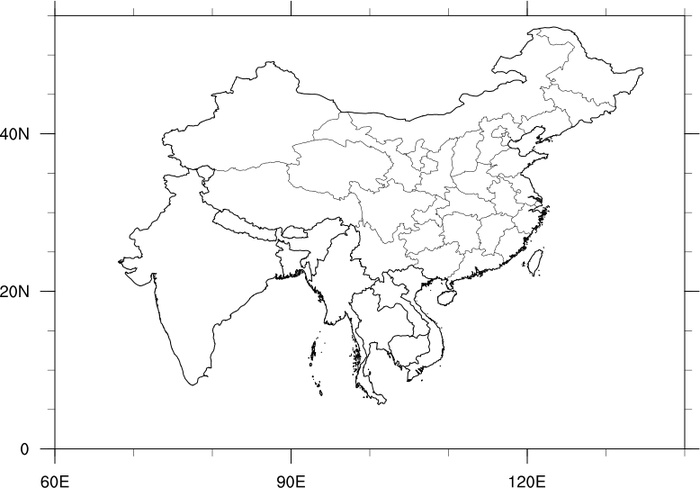 To draw the Chinese provinces, mpDataSetName must be set to "Earth..4" and mpDataBaseVersion must be set to "MediumRes". 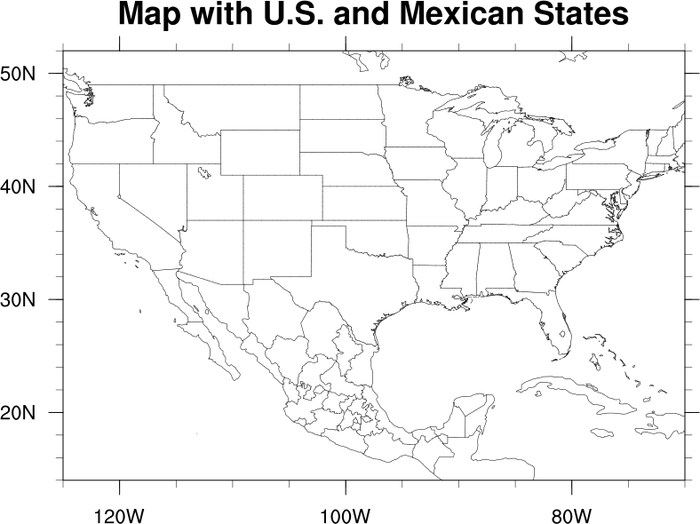 maponly_9.ncl: Demonstrates how to draw both US States and Mexican States. 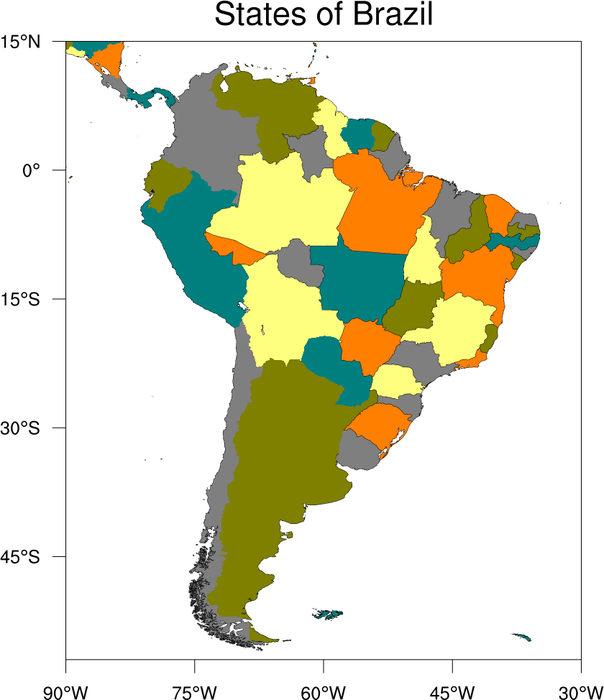 This method requires that the plot be drawn first an then the values for the Mexican States retrieved and added to the plot. maponly_10.ncl: Demonstrates how to draw all of the counties in the US, how to draw just the counties with the name "Adams", and then how to draw only the counties in Florida by listing them by name. The resource mpDataSetName needs to be set to "Earth..2" in order to have access to the US counties. 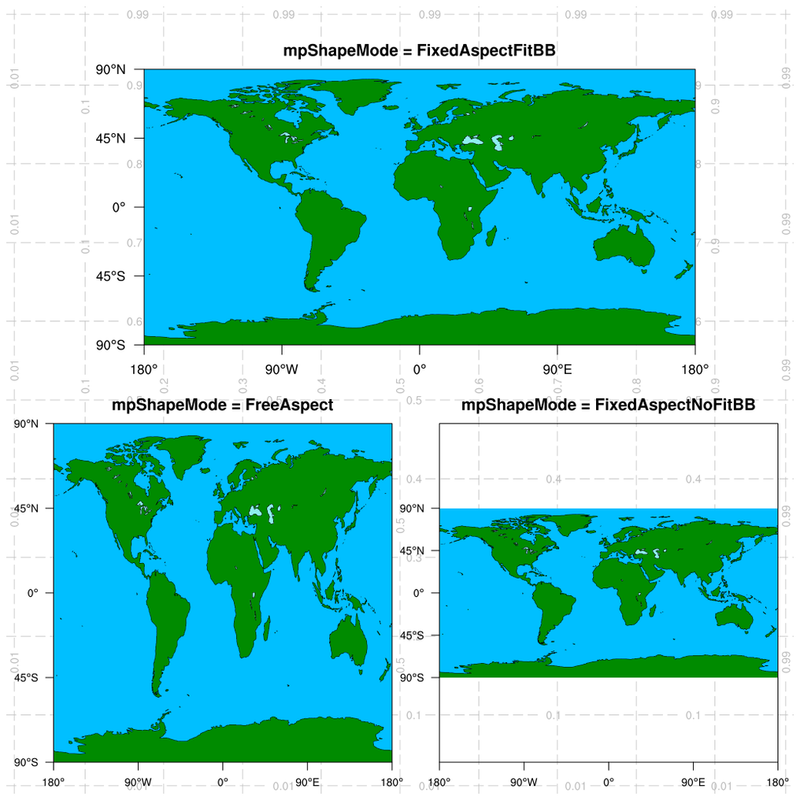 maponly_11.ncl: Demonstrates the difference in resolution between the three available map databases in NCL. mpDataBaseVersion is used to set the database that NCL uses to draw the basemap. By default, mpDataBaseVersion is set to "LowRes". The upper left panel shows the country of Greece with this setting. The upper right panel shows the same area with a database setting of "MediumRes". The bottom panel is drawn with a database setting of "HighRes". If you want to use the "HighRes" map database, you will have to download the RANGS database. 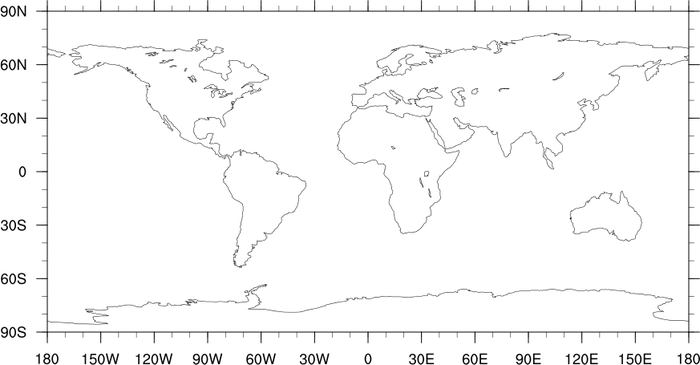 maponly_12.ncl: This script demonstrates the use of the resource mpProjection, which sets the map projection. 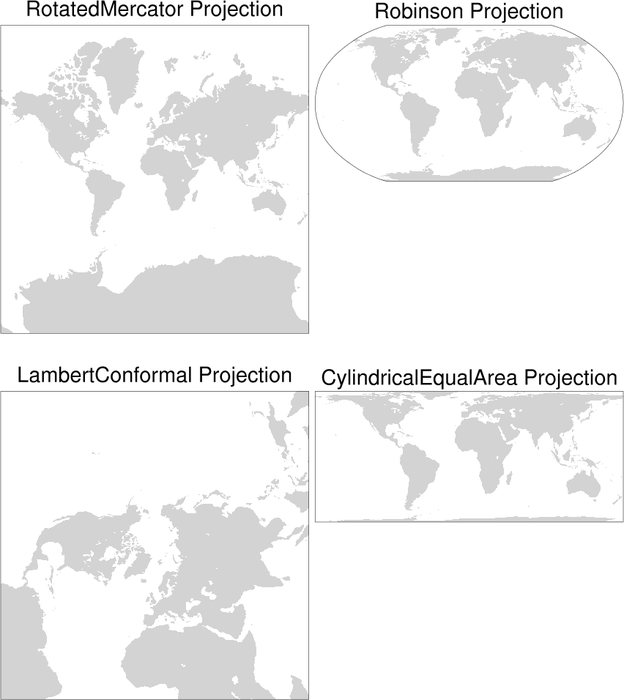 There are 13 map projections available; each is shown here. Resources are not set to limit the map area, and thus the default area (whole globe) is shown. The resources mpGridAndLimbOn and mpPerimOn are turned on and off throughout the program depending on whether the projection looks best with the perimeter drawn or with the earth's outline drawn. mpGridAndLimbOn = True ; turn on lat/lon lines. 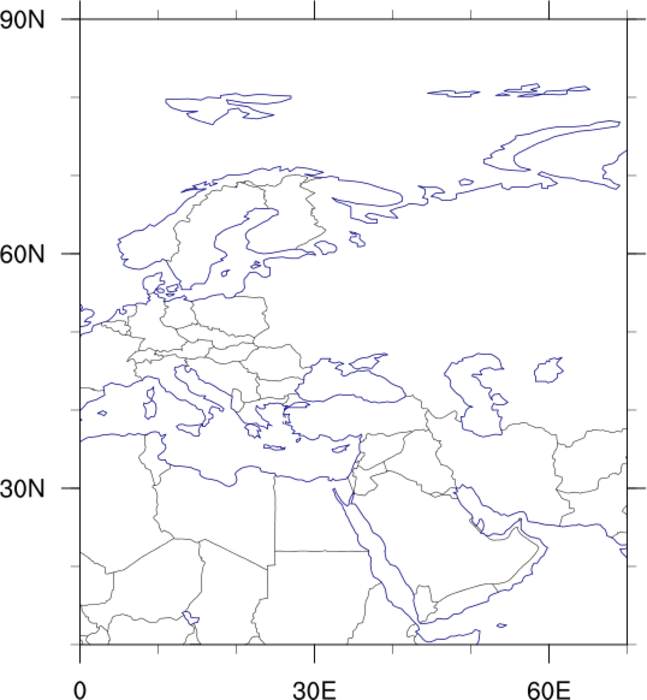 maponly_13.ncl: Similar to Example 12 above, except this script uses mpLimitMode and mpMinLatF / mpMaxLatF / mpMinLonF / mpMaxLonF to zoom in on Europe. 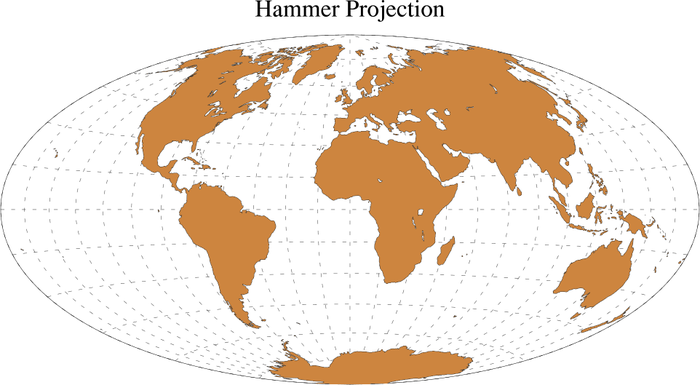 As in Example 12, this example doesn't always highlight the best use of each projection. 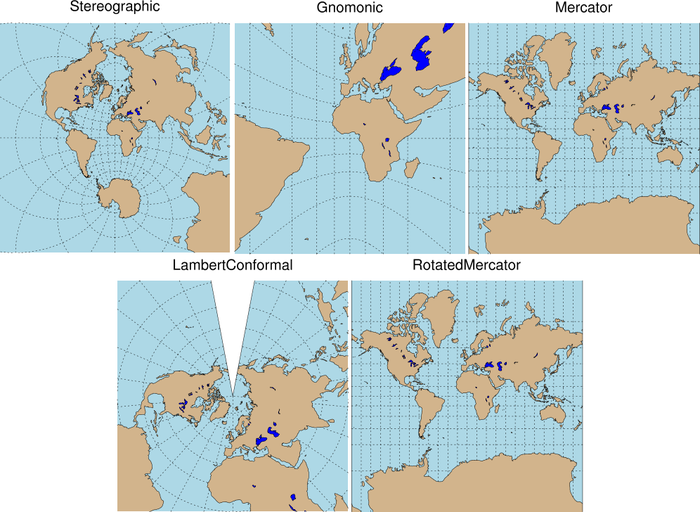 maponly_14.ncl: Demonstrates how to draw continental outlines without any inland water, lakes, or islands drawn, using a relatively new map resource mpMaskOutlineSpecifiers. You use mpOutlineSpecifiers and/or mpOutlineBoundarySets to indicate what outlines you want, and then you use this new resource to indicate which outlines you want to mask. 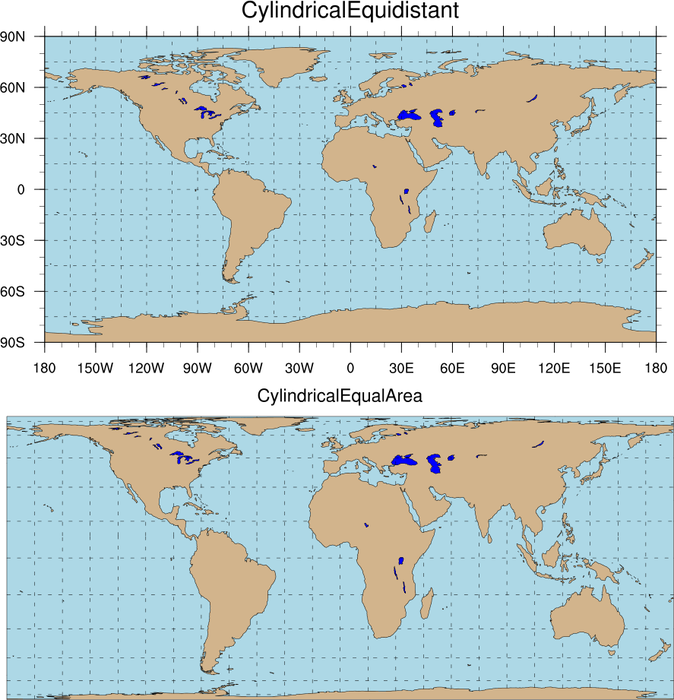 maponly_15.ncl: The first frame demonstrates how to draw climate divisions, by setting the resources mpDataSetName to "Earth..3", mpDataBaseVersion to "MediumRes", and mpOutlineBoundarySets to "AllBoundaries". 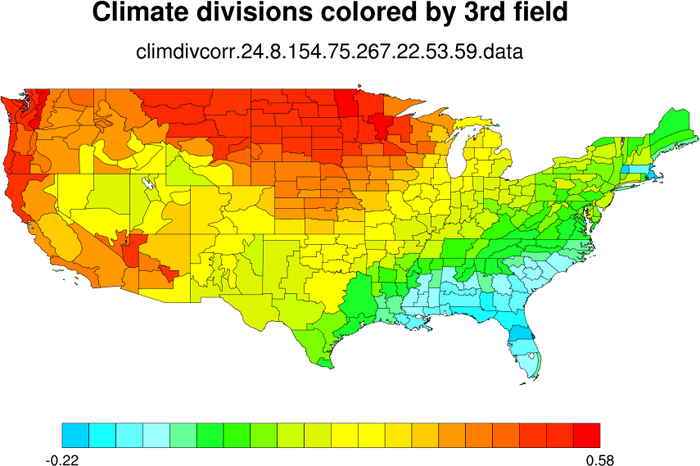 The second frame shows how to color the climate divisions by a third field. 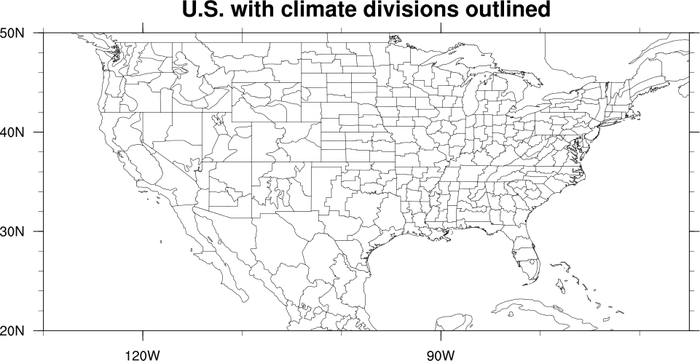 The climate divisions already have their own default color indexes (called "group ids") that you can use to color the climate areas such that adjacent areas will not have the same color. These default values are retrieved (via the mpDynamicAreaGroups resource) so that you can replace them with new color indexes based on this third field. 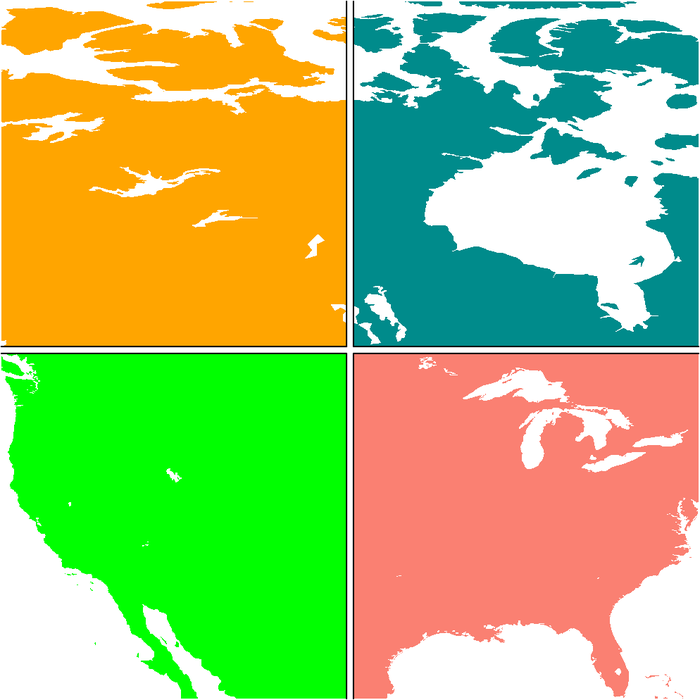 maponly_16.ncl: This example demonstrates how to use the map database, "Earth..4", to generate divisions for other countries. This example in particular shows how to draw the states of Brazil, the provinces of China, and the states of India. You must set the resources mpDataSetName to "Earth..4" and mpDataBaseVersion to "MediumRes". In addition, by using special quantifiers like "China:states", you can get these new divisions either as outlines (via mpOutlineSpecifiers) or as filled areas (via mpFillAreaSpecifiers). 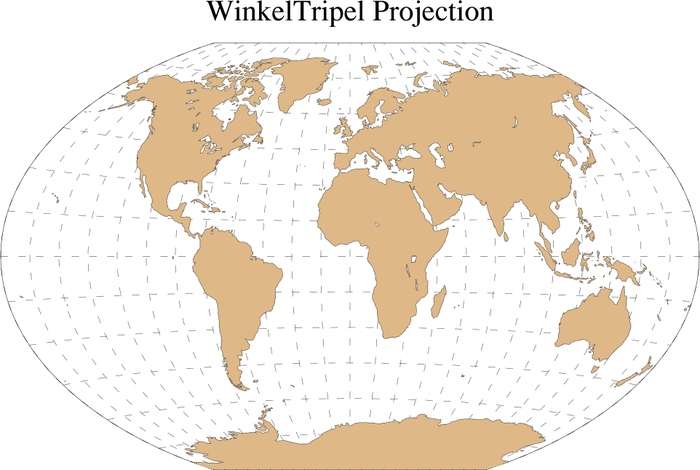 maponly_17.ncl: This example shows three map projections that were added in V5.1.0: Hammer, Aitoff, and Winkel Tripel. There's also a new-and-improved Mollweide (see the next box for an example of this) that replaces the old one. 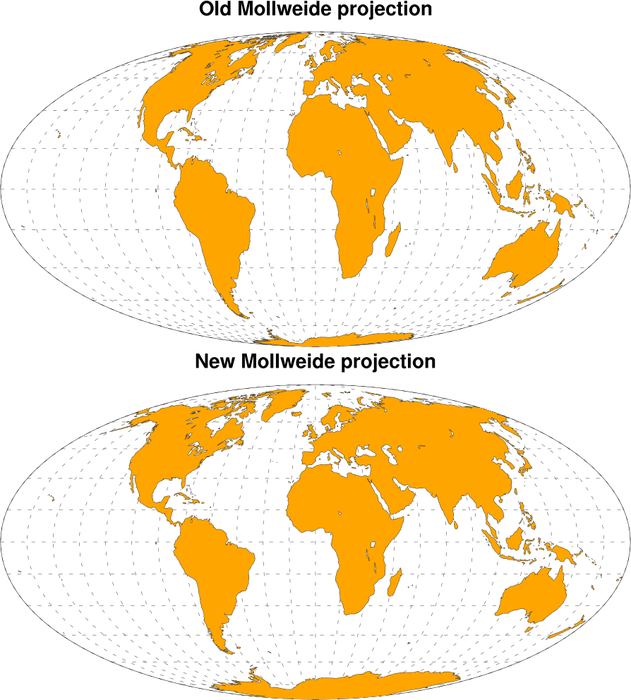 maponly_18.ncl: This example compares the new-and-improved Mollweide projection that was added in V5.1.0 to replace the old Mollweide projection. The old Mollweide, like a true Mollweide, has an elliptical perimeter twice as wide as it is high (though with different dimensions) and its parallels are straight and horizontal, as in a true Mollweide, but the shapes of the land masses are noticeably different. 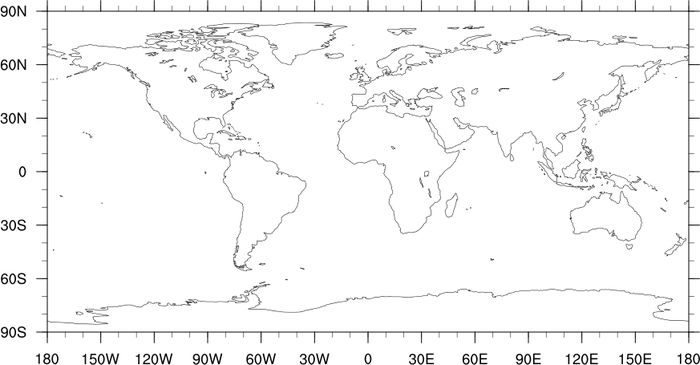 To get the old Mollweide projection, set mpProjection to "PseudoMollweide". 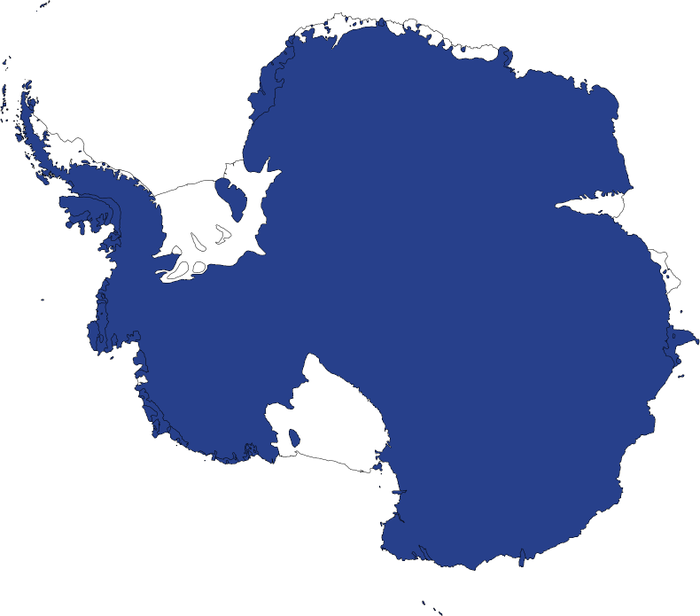 maponly_19.ncl: This example shows how to draw Antarctica with the new ice shelves that were added in V5.1.0. 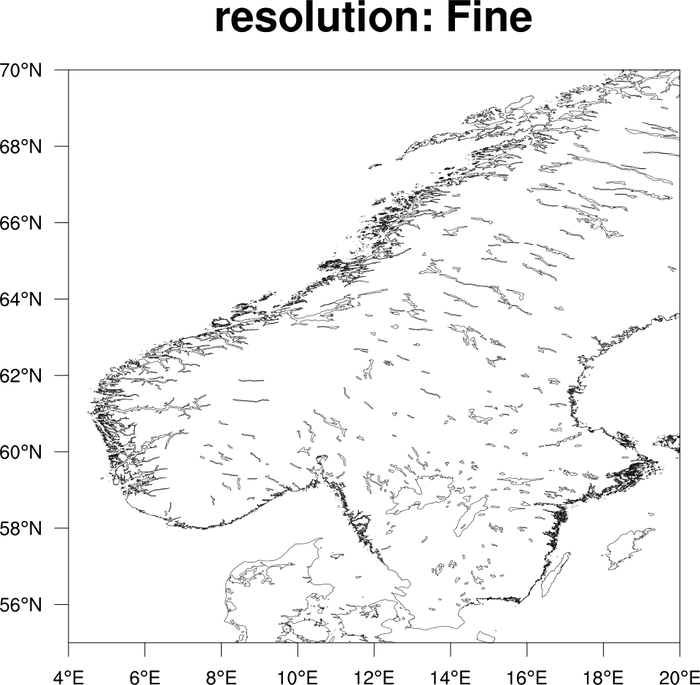 maponly_20.ncl: This example shows how to draw different resolutions of the coastal outlines when you use the "HighRes" map database. 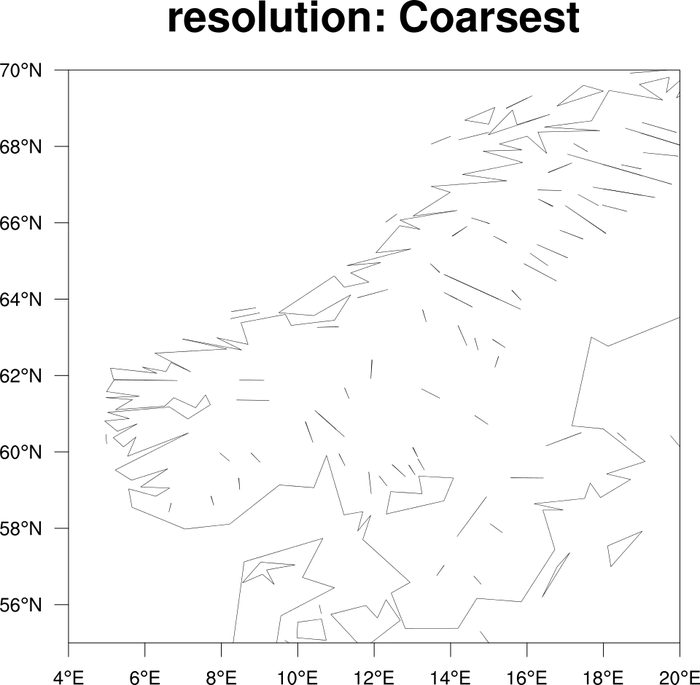 The resource is mpDataResolution, and the possible values are "Coarsest", "Coarse", "Medium", "Fine" and "Finest". You should only use "Fine" or "Finest" if you are zoomed in pretty far on the map. They can take a long time to draw. 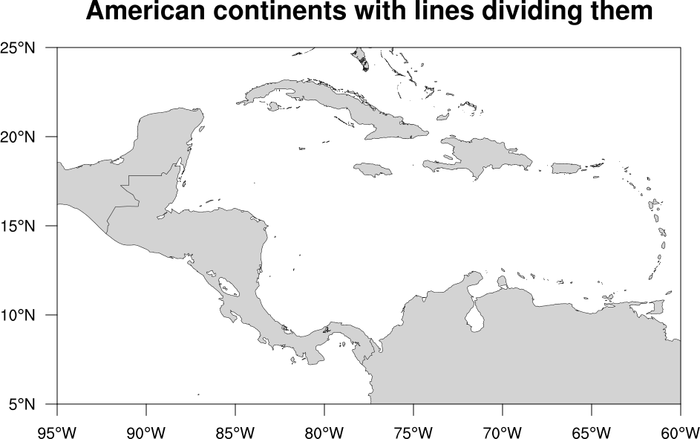 maponly_21.ncl: Demonstrates how to remove the lines that separate North America from Central America, and Central America from South America. 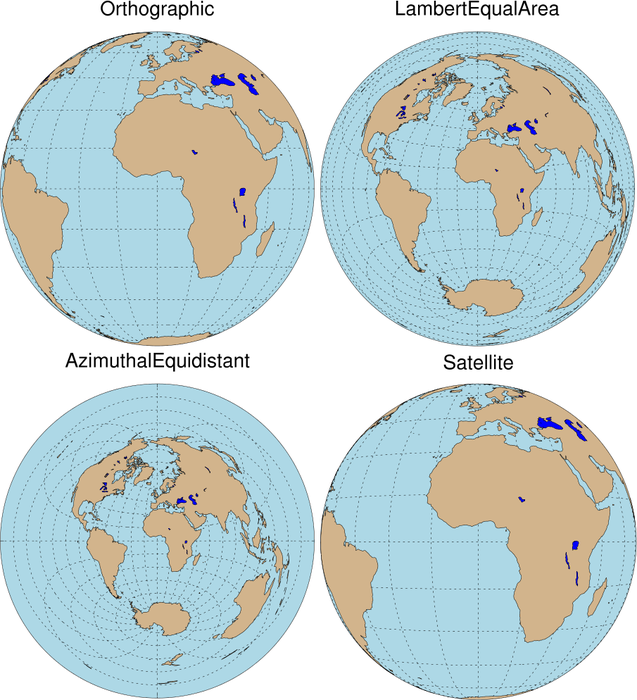 All 7 continents are outlined when mpOutlineBoundarySets = "Geophysical" (the default), as are all boundaries separating land from ocean. 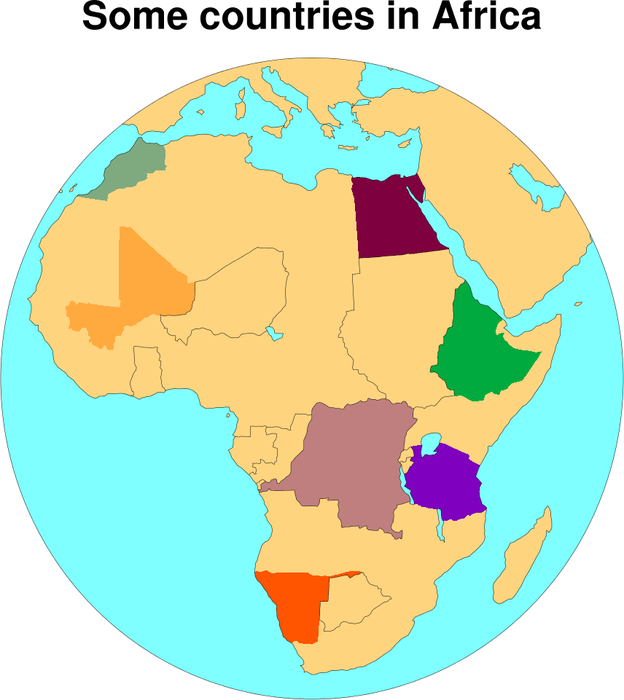 maponly_22.ncl: Demonstrates how to outline and fill specific countries by name, using the mpFillAreaSpecifiers and mpOutlineSpecifiers resources. 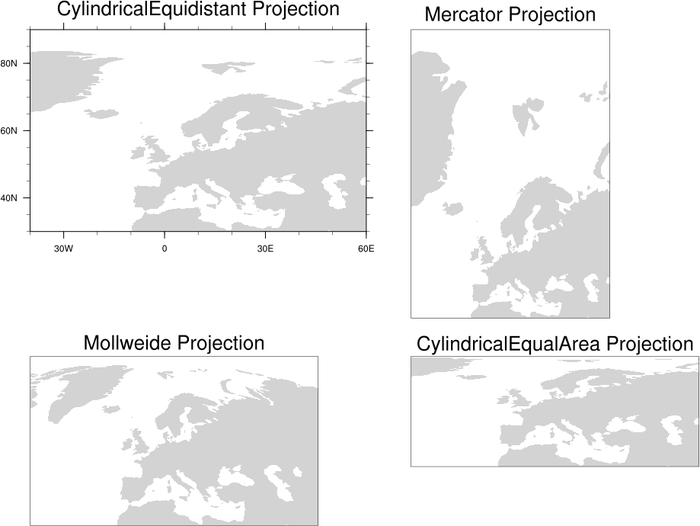 maponly_23.ncl: Draws all of the available map projections as of V5.1.1. maponly_24.ncl: Shows how to add minor tickmarks to a map that only has major tickmarks. This method only works if you have a rectangular projection and are setting pmTickMarkDisplayMode to "Always". The gsn_blank_plot function is used to create a tickmark object with minor tickmarks, and this is then overlaid on the map using overlay. 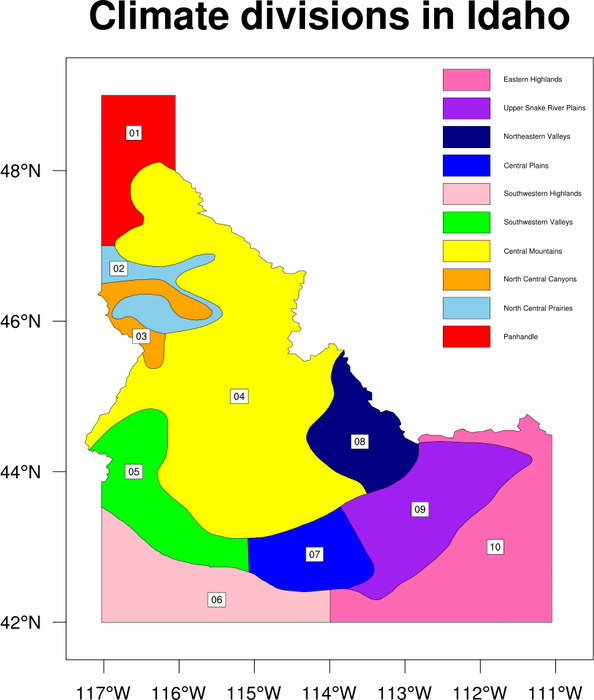 maponly_25.ncl: Shows how to fill the climate divisions in the state Idaho, and annotate the map with a labelbar and text strings. 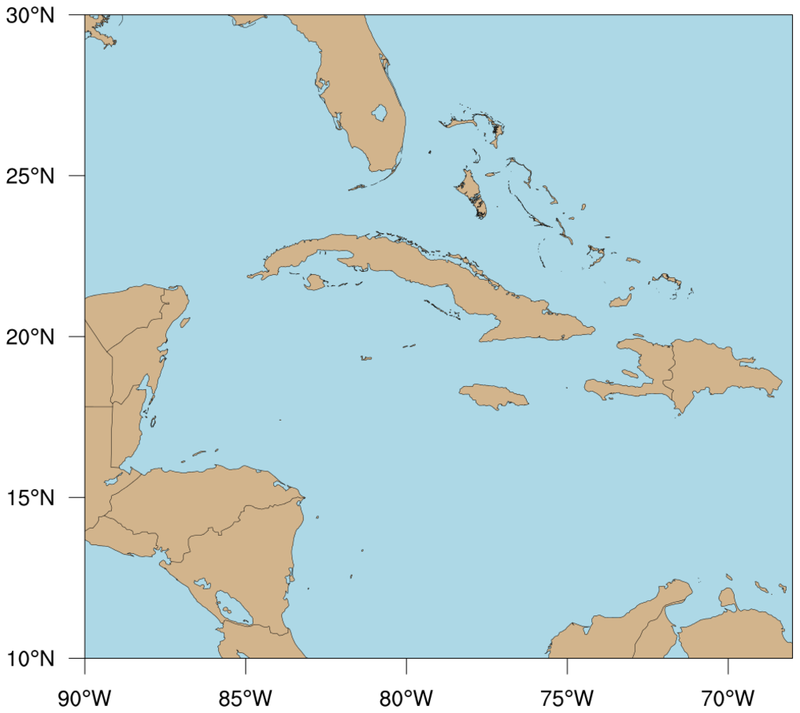 maponly_26.ncl: Shows how to turn on the medium resolution map database and get better outlines for the Caribbean Islands. 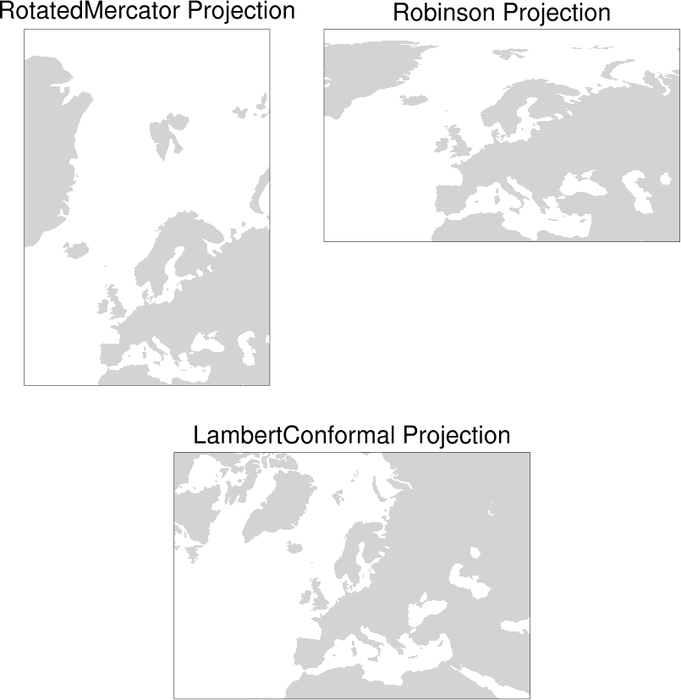 maponly_27.ncl: Shows how draw a map in four quadrants, using a lat/lon slice. The land fill is set to a different color for each quadrant, and certain borders are turned off depending on which quadrant you're in. maponly_28.ncl: This example shows the updates to counties in Colorado that were added in NCL V6.4.0. The first two images show the updated counties, and the second two images show the outdated counties, if you use NCL V6.3.0 or earlier. For an example that compares these new county outlines to shapefile outlines, see example shapefiles_15.ncl on the Shapefiles example page. 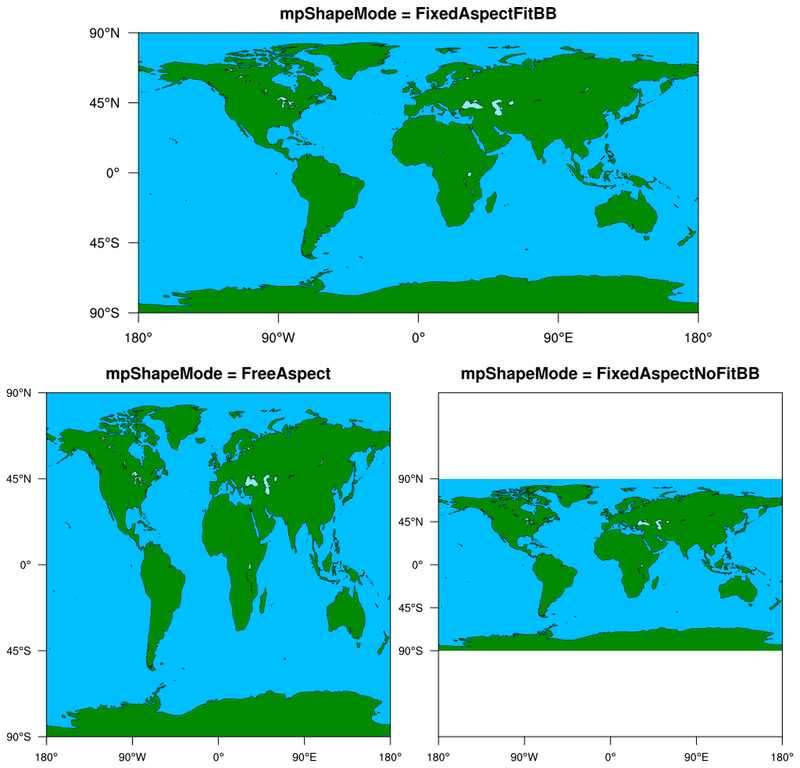 - FixedAspectFitBB: Maintains aspect ratio of the map. This is the default. - FreeAspect: Skews the map to fit the user-specified vpWidthF and vpHeightF viewport resources, and hence does not maintain aspect ratio. - FixedAspectNoFitBB: Maintains aspect ratio, and places map in a box with width and height specified by the vpWidthF and vpHeightF viewport resources. Next, it illustrates how to panel plots manually using viewport resources, which is easier than calling gsn_panel when the plots are different sizes, as in this script. Finally, it demonstrates the use of the function drawNDCGrid to draw a grid of NDC coordinates on the plot, which is used for debugging purposes, and to help choose values for the vpXXX (viewport) resources. 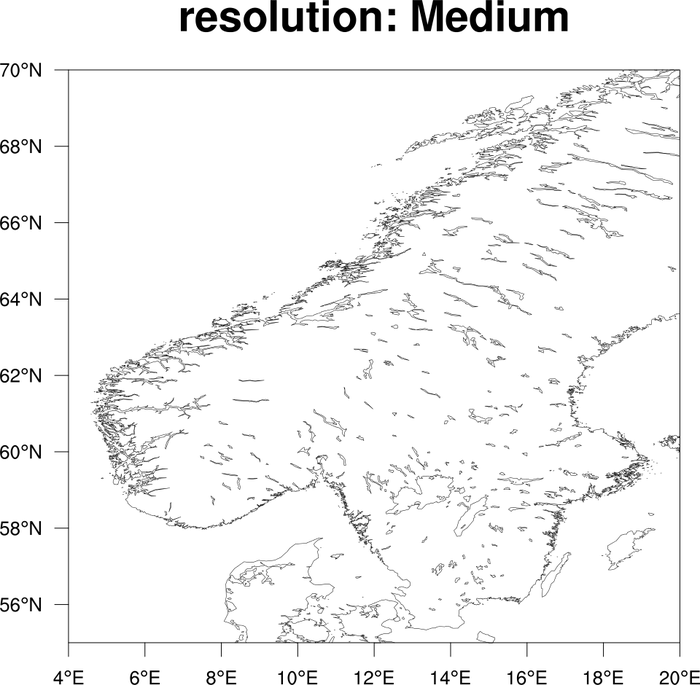 For a similar example of using these resources when contouring data, see example dataonmap_14.ncl on the Plotting data on a map examples page. 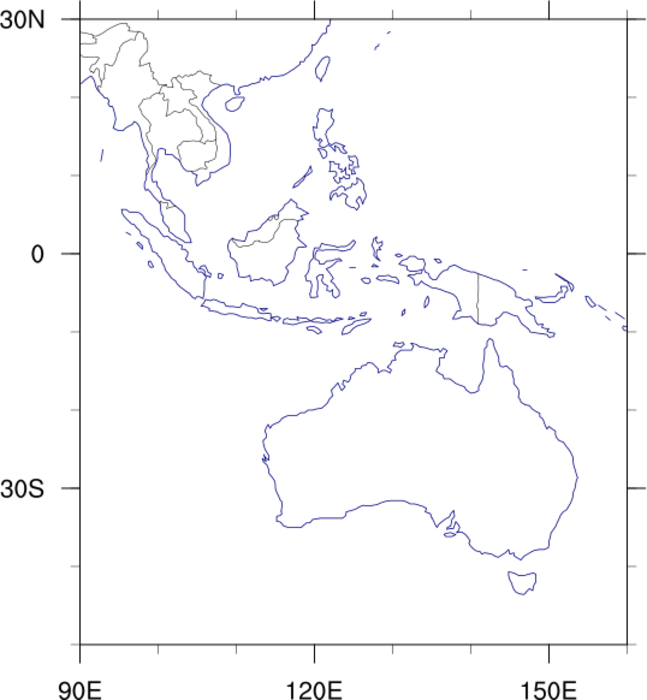 maponly_30.ncl: This script shows how to use the mpMaskOutlineSpecifiers to remove the outlines of India, while keeping outlines from surrounding countries. 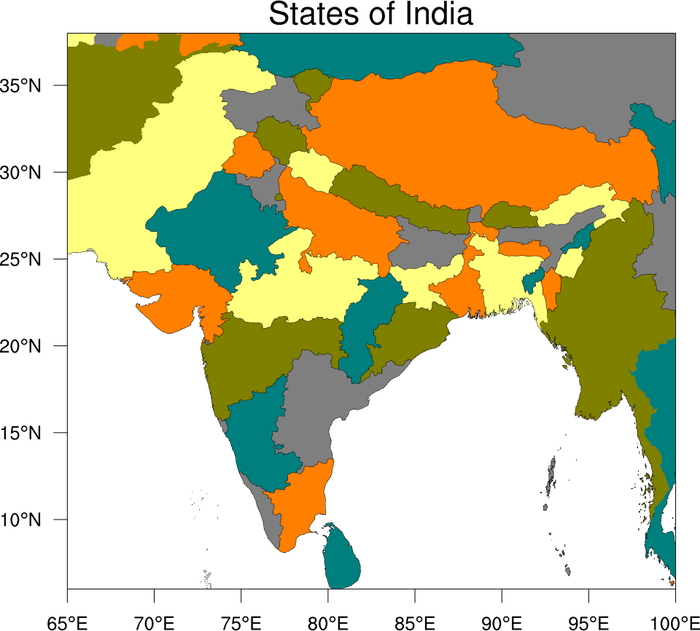 In the third plot, meteorological subdivisions of India were added using a shapefile downloaded off the web.